After many months of impatiently waiting, Warner Bros. finally unveiled the first official Justice League trailer over the weekend. However, there was a pretty big missed opportunity, in that, they didn't have a shot of the whole team standing together. Well, the newly released U.K. version of the trailer fixes that and gives us the whole team (minus the currently dead Superman) united together in one, epic shot. The Warner Bros. UK YouTube channel dropped this only slightly different version of the new Justice League trailer over the weekend. 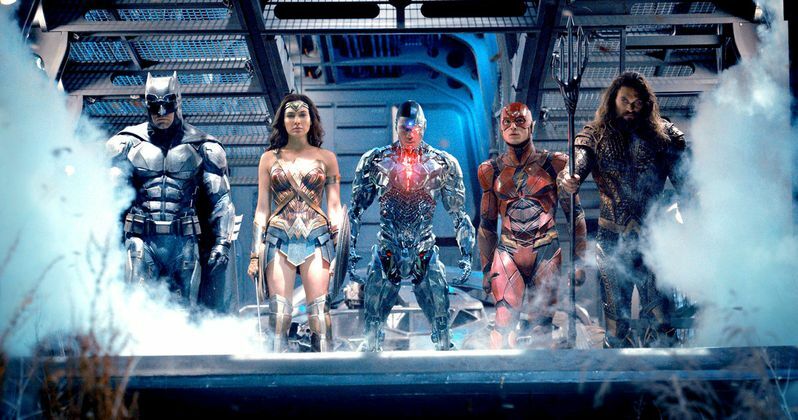 As was teased in the preview videos leading up to the release of the new trailer, this U.K. version gives us the shot of Batman, Wonder Woman, Aquaman, Cyborg and The Flash all standing together as a united front. For whatever reason, this shot was left out of the U.S. version of the trailer. Beyond that shot, the U.K. version of the Justice League trailer appears to be identical. But that one shot makes a big difference. Here is the official Justice League synopsis. Outside of the footage that was released last summer at San Diego Comic-Con, which wasn't considered to be an official trailer, this is by far the best look at Zack Snyder's Justice League to date. The trailer seems to be garnering more positive reaction as opposed to negative reaction by fans online, but there has definitely been some criticism. That probably has to do with the fact that Batman V Superman: Dawn of Justice and Suicide Squad let down many viewers and most critics, despite both movies having very promising trailers. There is some understandable reluctance on the part of some viewers. But again, there seems to be much more excitement than negativity. Generally speaking. If the movie is good, it doesn't even have to be great, it really will help Warner Bros. moving forward with the DCEU. The cast for Justice League includes Ben Affleck as Batman, Henry Cavill as Superman, Gal Gadot as Wonder Woman, Jason Momoa as Aquaman, Ezra Miller as The Flash, Ray Fisher as Cyborg, Amy Adams as Lois Lane, Willem Dafoe as Nuidis Vulko, Jesse Eisenberg as Lex Luthor, Jeremy Irons as Alfred Pennyworth, Diane Lane as Martha Kent, Connie Nielsen as Queen Hippolyta, and J.K. Simmons as Commissioner Gordon. Justice League is directed by Zack Snyder and is set for release on November 17. Be sure to check out the UK Justice League trailer for yourself below.